Yuishin Kai Karate jutsu was created by Hanshi Motokatsu Inoue in 1948. The name originated from Seiko Fujita (1898-1966) the last true Ninja and headmaster of the Koga Ninjitsu Ryu. He was the watchful guardian of Motokatsu Inoue (Julian Mead’s teacher) from childhood. Seiko Fujita gave Inoue Sensei permission in 1948 to open a dojo in Shimizu City and named the style, also creating the calligraphy, which forms the mon (emblem or badge) denoting the style. Yuishin Kai is interpreted as “in the pursuit of the understanding of Budo, only the heart, spirit and mind exist”. In addition to the aforementioned Inoue Sensei trained with Choki Motobu, a close friend of Yasuhiro Konishi, renowned for his kumite and study of Naihanchi Kata. This is reflected in the system. This Yuishin Kai open hand system forms part of the Ryukyu Kobujutsu approach and way of thinking in Bujutsu and the Ryukyu Kobujutsu approach and way forms part of the Yuishin Kai Karate way and approach in Bujutsu, thus inextricably linking them together. The main influence for Sensei Inoue in the creation of Yuishin Kai karate was Yasuhiro Konishi (1993-1982) the founder of Ryobu Kai and a close friend of both Seiko Fujita and Shinken Taira. Konishi was a man of great energy and studied his karate mainly from Gichin Funakoshi (Nihon Karate Kyokai) in Tokyo and Kenwa Mabuni (Shito Ryu) in Osaka. As well as his passion for kata he had a fondness for kumite, which he displayed undiminished by the passing of age and time. 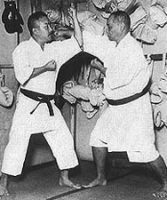 Konishi liked to combine blocking with punching and kicking simultaneously and this can be found much in the Yuishin Kai syllabus. He felt Karate too linear and Aikido too circular and his training drills reflect much the principles of Nan Ban Sato Ryu. Yuishin Kai also incorporates many elements of Sensei Shioda’s Aikido. Fujita felt his approach to be practical and relevant to actual applications and influenced the integration into the Yuishin Kai approach. The system follows strongly the three principles of Japanese Bujutsu; Kihon, Kata and Kumite. It systematically teaches the building blocks of Waza (technique), followed by the usage approach of Genri (principles). This builds the necessity of Heiho (strategy) and builds the character for Seishin (spirit) and Kokoro (heart). The principles of strategy (Sen no Sen, Go no Sen and Tai no Sen) form an important part of the approach in Yuishin Kai Karate Jutsu.The syllabus starts with Shuri Te and from Shodan commences the practise of Naha Te. This is paramount to the evolution of the student from long distance waza to shorter more powerful internal technique. Yuishin Kai embodies the necessity of Tai Sabaki (body movement) but recognises the training needed to hold the line where required. The mentality of Shin, Ki, Tai is taught and studied in conjunction with the reality of fighting. Inoue Sensei has instilled in the style the awareness and understanding of actual fighting and the training required to provide the student with the skills to be able to deal with this. First there is fighting and lastly there is fighting. Whatever else is learnt on the journey is a benefit. Knife work (Tanto and Hamno dori) is introduced from Shodan and the techniques are direct and simple to ensure the reality is not lost with the colour and extravagance of complexity. A mind under pressure does not embrace and is not able to deal with the harshness of real intention and violence. This understanding combined with the study of weapons in Ryukyu Kobujutsu training makes the realisation of effective bunkai that works very evident. Kumite forms a strong part of training and the traditional training approach in Japan did not hinder the success of students when they entered open competitions to broaden their study and understanding of kumite. Not liked by Sensei Inoue competition nevertheless was a successful aspect of training for Yuishin Kai students. This ability to walk both floors of fighting is a clear indicator of the style content being relevant to the building of the qualities needed to be a student of Bujutsu and the adaptability needed to be successful. The need to train by oneself (Hitori Keiko) was and is an important element of the training approach. Inoue Sensei demonstrated this all his life and was insistent that all students adopt this philosophy to fully understand the hard work and discipline needed to understand Yuishin Kai karate and true Bujutsu. Words of great merit and flair have no relevance in the true arena of combat. One must train with perseverance and be unrelenting in the pursuit of understanding and the growth of ability and mental strength. Without this approach the understanding of strategy and tactics can’t be deployed or utilised to defeat your opponent. Yui Shin Kai Karate embodies the philosophy of Sensei Motokatsu Inoue in that students must be of good character, respectful, modest, hardworking, adaptable, resourceful and able to improvise. They must persevere and know frustration and understand through diligence and the right way that good students will be realised. The style is unique in that it still retains all the traditional qualities of Bujutsu where everything including Jujitsu and Shuriken Justu were taught to the students. This is in contrast to the segregated teachings found commonly today where you have to attend different dojo to acquire different skills. The style of Yui Shin Kai Karate has spread all over the world to countries which include South Africa, Sweden, Finland, Australia, America and now, under the guidance of Julian Mead – the United Kingdom. Karate training is often combined with Ryukyu Kobjutsu on the courses and seminars held by the Association. Sensei Mead also provides regular instruction to the established Yui Shin Kai Karate Club in Surrey, United Kingdom, where new students are always welcome. For full details please see Club & Membership.